Find the mass of Jupiter based on data for the orbit of one of its moons, and compare your result with its actual mass. This is College Physics Answers with Shaun Dychko. Let's figure out a formula for finding the mass of some body that is being orbited by something else, so a planet being orbited by a moon in other words. If we use data from the moon's orbit such as its orbital radius and its period, we can figure out the mass of the planet that it is orbiting. So the force of gravity that the moon is experiencing is the centripetal force and centripetal force is the mass of the moon times its speed squared divided by its radius of orbit. Then the force of gravity is gravitational constant times the mass of the planet times the mass of the -- divided by the radius of its orbit squared. Now the speed of the moon is going to be the circumference of the circle it's traveling, two pi r, divided by the time it takes to do that full orbit. So we'll substitute that in for v, and so that becomes four pi squared rsquared over t squared when you square this and then multiply by m over r, and on the other side we're left with the same. Then we'll multiply -- well, both sides by r squared. I suppose we could have divided by m here in this step as well but I did this in two steps. So multiply both sides by r squared and this gives us r cubed on the right hand side because this r cancels one of the r's that are in there. So this ends up to being r to the power of one which then multiplied by the r squared there, makes r to the power of three. The m's cancel, we can divide both sides by m and we get g m equals four pi squared r cubed over t squared, and then divide both sides by the gravitational constant. We get the mass of the planet is four pi squared times the radius of some moon that's orbiting it, squared or cubed, divided by the gravitational constant times the period of the moon's orbit squared. So we can use any moon and it should all give the same answer regardless of which one we use. So looking at Table 6.2 where you consider the moon Io for Jupiter, it has an orbital radius of 4.22 times ten to the five kilometers and we have to convert that into meters by multiplying by 1000 meters per kilometer and then cube that, multiply by four pi squared, divided by the gravitational constant and then take its orbital period, convert it into seconds. 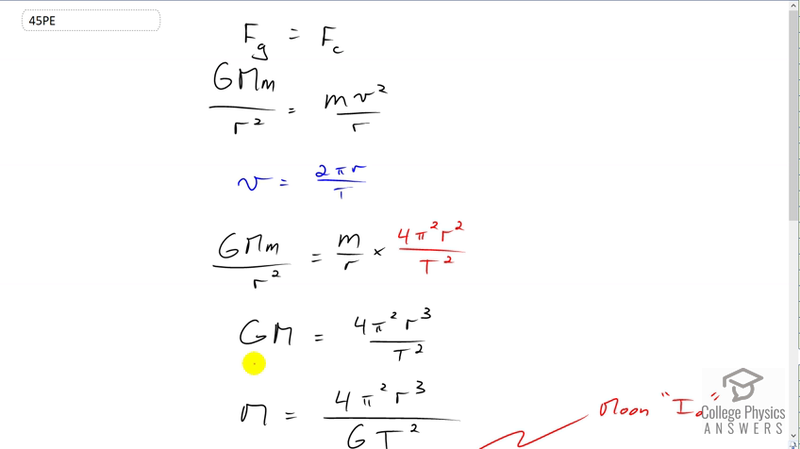 We need to have mks units, meters, kilograms and seconds in order to use this formula because this gravitational constant has units of kilograms and meters in it. So, 1.77 days is the orbit of Io and then times that by 24 hours per days times by 3600 seconds per hour and then square that result. We end up with 1.90 times ten to the twenty-seven kilograms is our calculated mass for Jupiter. If you look at Wikipedia mass for Jupiter, it says 1.898 times ten to the twenty-seven kilograms which to two significant figures is the same because if this was rounded to three sig figs it'd be 1.90.